I am only an indirect distant relative of this Concert Group but my interest was first stimulated some 20 years ago when an aunt passed on to me an original Till Family Rock Band concert programme, dated 1885 (see right, click to enlarge). Will have the honour of appearing as above, under the distinguished patronage of the Right Honourable The Earl of Breadalbane, the Right Honourable the Earl of Kinnoull, Colonel Macdonald Macdonald of St Martins, and Andrew Coates,Esq., Pitculien House,&c.,&c,. For particulars see window bills and circulars. Doors open at 7.30; Commence at 8; Carriages at 9.45. Tickets reserved and numbered,3s; First Seats, 2s; Second 1s; Third 6d. at Messrs. Paterson,Sons,and Co; and at Hall Door. Some original admission tickets survive, though identity of performance arena is not identified and prices varied according to venue. (Examples on right-click to enlarge). Since that time I have collected information from various sources in UK and USA. The Till family were one of three who lived in the Lake District and constructed stone notes from rock removed from a valley alongside the mountain known as Blencathra. 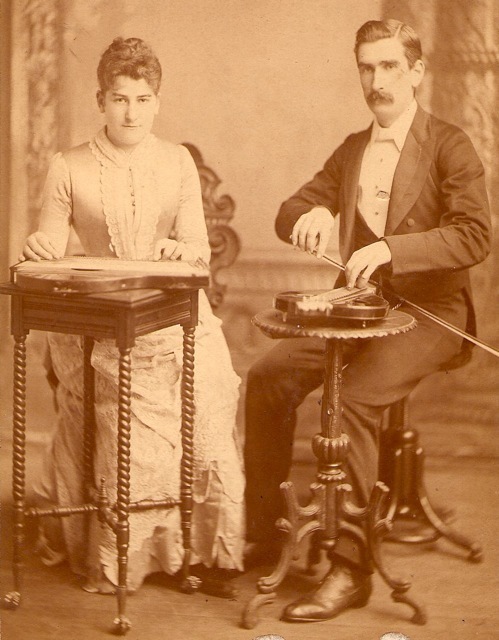 The Richardson family produced their instrument and played throughout the UK (instrument is in good condition and exhibited in the Keswick Museum / Cumbria). 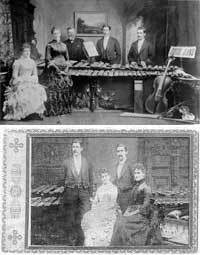 The Abraham’s were the last family to have their own instrument but it's whereabouts has never been established. The Till’s instrument would date from 1870 to 1880 for construction. 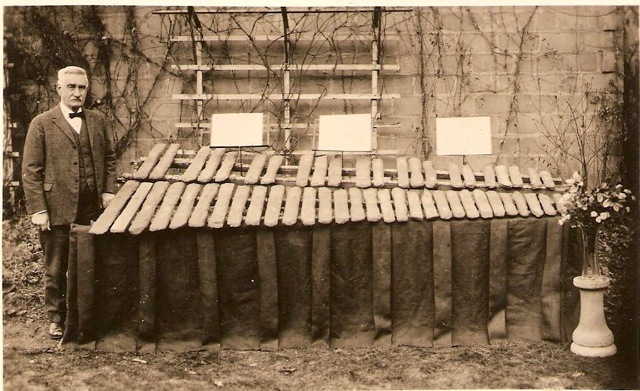 The instrument consists of a wooden trestle, some 11 or 12 feet long, supported two shelves of stones tuned to give 5 octaves - 65 notes insulated and mounted on straw ropes. Wooden hammers covered in leather were used as percussors. Individual stones measured from 30ins to 6ins long and up to 3" broad or more. Family group with complete instrument. Click to enlarge. A BBC Radio 4 programme in 2006 presented by the international percussionist Evelyn Glennie featured the instruments in the Keswick and Coniston Museums and the Richardson stones have been played in public at a number of concerts mounted on a modern wooden sounding board. Besides performing in their own locality, the Till Rock Band toured Birmingham, Bath, Brighton, Liverpool and Llandudno,Darlington and Preston, Torquay,Scarborough and York. Scottish appearances were in Perth and Dundee. They even played in the Isle of Man. Their crowning performances of 136 concerts were at the reconstructed Crystal Palace site at Sydenham in 1881. Recent research has revealed a superb advertisement for their appearances in the main auditorium. See image on right (click to enlarge). 1. Owned by a near relative - single octave. 2. Under care Lancaster Maritime Museum - single octave. 3. Instrument originally presented to John Ruskin who admired the sound of the instrument - this small version is in the Ruskin Museum, Coniston. Brantwood, Coniston. Lancashire 9th September 1884. I am extremely grateful for the specimens of Skiddaw Rock, and congratulate you most heartily on the wonderful instrument you have composed of such materials, no less than on the admirable skill of execution with which you have learned, aided by your Father, to exhibit its peculiar qualities. You may have given me, with a new insight into the nature of crystalline rock substance, also a musical pleasure. Various reports in UK and USA lead one to believe that the family were of a Non-Conformist background and supported their local churches with fund raising etc. Indeed they performed for several years at the Chautauqua Institution. Originally this was a Methodist Foundation in 1894 but is now open to all faiths not only to increase knowledge of religion but also education and the arts. Thomas Edison,of phonographic fame, was Honorary President of this Foundation and a friend of the Tills. Photographic material available gives insight into the dress of the performers and the main Harmonicon and additional instruments mentioned in the programmes. Cello and violins, swinging harps and musical glasses gave variety to the performances as well as vocal solos. We have detail of the nature of Zither and Gigilera also mentioned. Accuracy over dates is difficult but by 1895 the Till family decided to tour America and in the end stayed for 5 years as a performing group. They settled in Bayonne, New Jersey - Manager William Till's address is listed as 715 Ave. C (telephone 51A Bayonne!). They toured the USA and Canada (Ontario, Nova Scotia, New Brunswick) and it is recorded that in total they performed 8,000 concerts and never failed to fulfil a booking! After five years the group decided to disband with three members returning to the Lake District in UK. 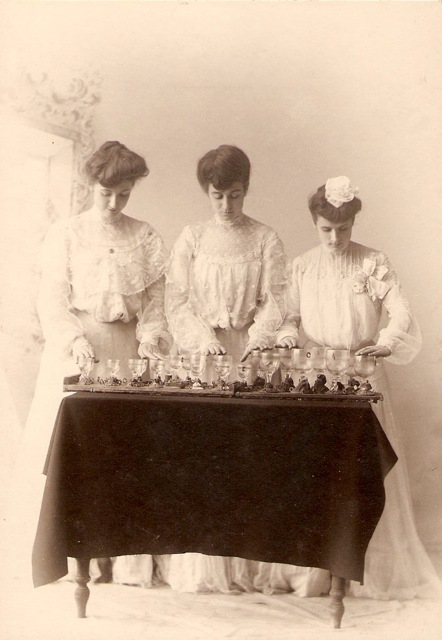 However, William remained and continued to perform ably assisted by his three daughters Esther,Mildred and Greta. 1999 saw the publication of Images of America - Bayonne in which there are descriptions and references to the Till Family Rock Band and as a result of this publication references to Till family activity have been extracted from the "Bayonne Herald". Organist and Choirmaster St Johns P.E. Church, can now take pupils on the piano, organ, violin and zither No. 42 West 37th Street, Bayonne City. He was apparently organist at this church for 27 years. I am indebted to all those who have supported my researches and contributed. In particular my colleague,Andy Alliffe, has also researched the Lakeland Rock Band story and compiled a very professional and detailed manuscript on the subject. Recently much background to the Till Family in the USA has come to light with William Till’s personal scrap book and notebook. Any new information would be very gratefully received! 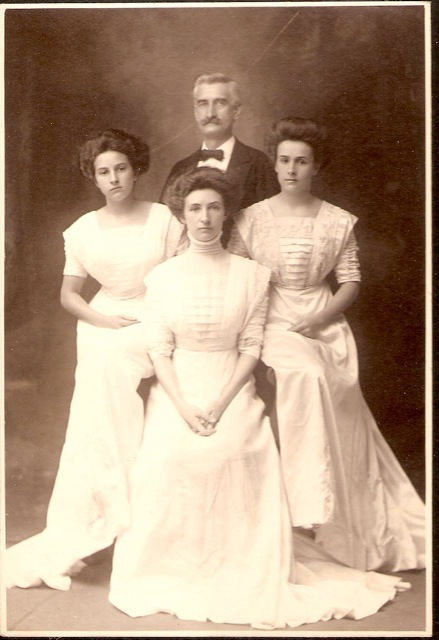 William Till with three daughters Esther,Mildred and Greta. This image appears to show William with the Rock Band at his retirement home and garden in East Orange. Professor Kathleen Middleton Author of Images of America  Bayonne. Bayonne Public Library, New Jersey, USA. Metropolitan Museum of Art-New York Curator of Musical Instruments. Tony Bingham ( London) Specialist in Old Rare and Unusual Musical Instruments. Beamish Open Air Museum-Durham. UK. Keswick Museum and Art Gallery Cumbria UK. Wilfred L Thornthwaite, Rugby, Tennessee, USA. 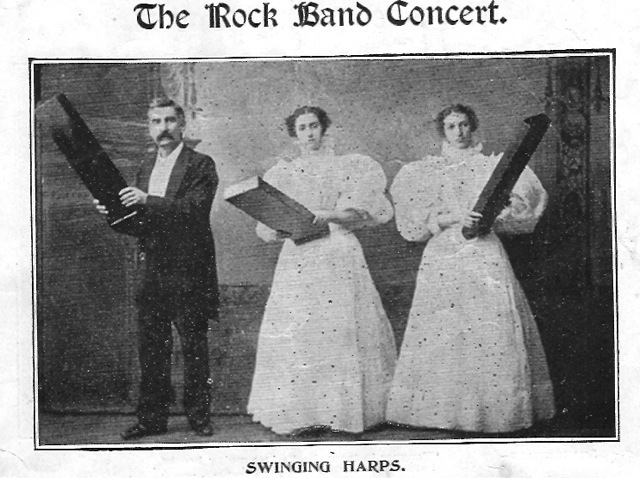 (The Till Family Rock Band can be found under 19th Century American music in the History section).